I was happy to receive my first printed proofs this week from Createspace. They look pretty good! Flipping through the printed copy is so much different than on a screen – computer or eReader. There is just something about holding that book in your hands. Of course, they are not perfect, I need to shift the spine image just a little, but other than that I am very happy with how they turned out. Both my boys were pretty excited about seeing it come to life. I’ve haven’t let either of them read it yet. I guess in some ways I am a little nervous about it. Two of the characters in the books have some similarities to them… It will be interesting to see how they react. My first promotional push starts tomorrow. 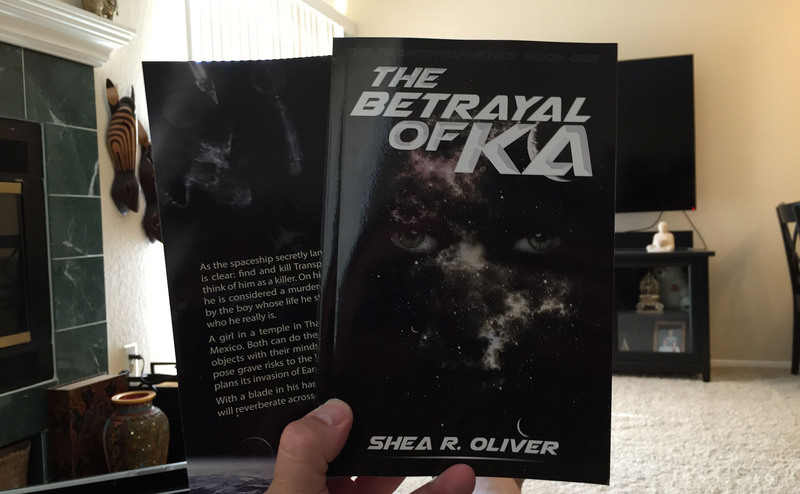 My main goal is to get The Betrayal of Ka into as many hands as I can, and to begin to grow my presence as an author. Friday, I am launching a Goodreads Giveaway. These are an interesting aspect of the Goodreads platform. It is a great way to begin to build some brand presence and expose your work to potential readers. I’ve read very conflicting approaches on how to run a successful Goodreads Giveaway. I’ve decided that I will run a short giveaway for a couple of copies of the novel. This will put my book into two of the “tabs” on the Goodreads Giveaway page. I’ll show up on Friday in the “Recently Listed” tab, and then next weekend, I should begin to appear in the “Ending Soon.” This should give me 2-4 days of being fairly visible. I’m am coupling this with three free promo days through Amazon. On Friday, Saturday, and Sunday, you can download The Betrayal of Ka for free from Amazon. I’ve spent the last couple of weeks prepping for these two campaigns. Some of the promotional efforts include Facebook Posts (including Boosts), purchased promotional packages (including features on book websites, email features, Facebook posts, Twitter, etc.). I’ve found a number of other free resources for promotion too. Wish me luck!